Besides all the wonderful Christmas prayer, liturgies and rituals throughout the last week, I fell upon a great book that I can't help but share with you. It is the seventh in a series of mysteries set in rural Quebec and there is a charming and attractive overarching French and wilderness feel throughout the story. The Chief Inspector, Armand Gamache, is one of those rare, high moralled, kind, humble and intelligent legendary detective figures that we all dream exist in our imperfect world. The Beautiful Mystery has Gamache enter the monastery of Saint-Gilbert-Entre-les-Loups, the home of 24 Gilbertine monks, cloistered and carrying on the life there, all but "invisibly," over the last four centuries! They have but one specialty: Gregorian Chant--sung better, clearer and more beautifully than anywhere else on earth. When the choir director/prior is found murdered, the Surete is called in. 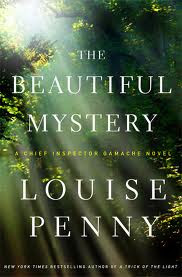 Louise Penny must have visited a monastery or thoroughly picked the brain of some monastic, for there is no way she imagined this quite accurate look into community life. Armand's experience at Saint Gilbert's, both spiritual and professional, is a great read--especially for those of us who also know the insides of monastic life. 12+ inches turned our world into a beauty.